View More In Letter Trays & Stacking Supports. Heateleper Focus on Solving Your Office&Home Problem, Give You Tidy and Neat Office&Home Environment. 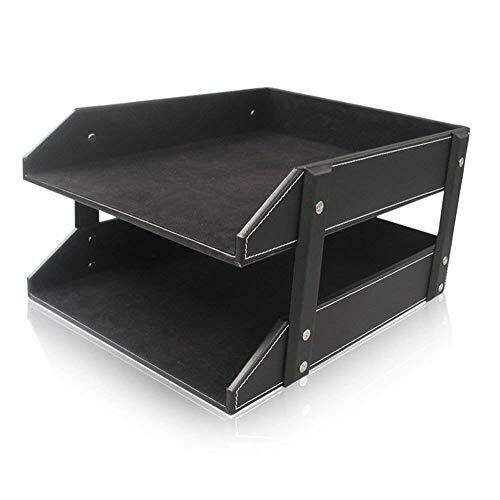 This fashionable multifunctional desktop file rack can be used to organize Document, A4 paper, mobile phones, remote controls, pens, pencils, scissors or business cards or other small supplies etc. Makes you desk neat and orderly, provides you a tidy environment. - Material: PU leather and flannel. 1 x Multifunctional desktop file rack(need to be assembled). Material: Made of high quality PU leather cover, interior is exquisite and soft flannel, sturdy and durable, easy to assemble. Size: 13.78 x 10.83 x 7.87inch/35 x 27.5 x 20cm; The height between two layer is 4.5 inches. Fashionable and simple style, Great for office, school and home which makes your desk organized and neat, easy to find the item you need and save time. Display and organize your work or school files, folders, and supplies. use to organize Document, A4 paper, mobile phones, remote controls, pens, pencils, scissors or business cards or other small supplies. Package included: 1 x Multifunctional desktop file rack(need to be assembled). If you have any questions about this product by Heatleper, contact us by completing and submitting the form below. If you are looking for a specif part number, please include it with your message.